Location: UC San Diego 9500 Gilman Dr., La Jolla, California, USA. 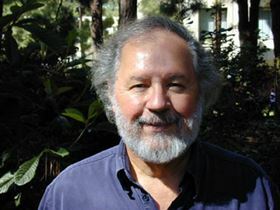 Professor Brian Maple (Photo courtesy of UCSD). When did you set up your group? Our group has been running since about 1973 when I received my first appointment to the UCSD Physics Faculty. I was fortunate to be able to spend my entire academic career at UCSD since the time I entered the Physics Department as a graduate student in 1963. The team usually consists of two or three postdoctoral scholars, five to seven graduate students, several undergraduate student volunteers, and an assistant who helps prepare proposals and reports, makes travel arrangements, etc. We also host researchers from other universities and institutes for between a few weeks to a year. We study various types of multinary compounds based on transition metal, rare earth, and actinide elements. These materials provide a wealth of strongly correlated electron phenomena, including unconventional forms of superconductivity, exotic types of magnetic order, hybridization gap semiconductivity, quantum criticality, metal-insulator transitions, spin-orbit interaction effects and colossal magnetoresistance. The occurrence of such a wide range of phenomena arises from a delicate interplay of competing interactions that can be tuned by varying an external control parameter, such as chemical composition, pressure, or magnetic field. A particularly striking phenomenon that has been observed in many correlated electron systems is the emergence of superconductivity near the critical value of the control parameter (usually, composition or pressure) where a magnetically ordered phase is suppressed towards 0 K.
A major effort in our laboratory has been to perform experiments that provide information about the interrelation between superconductivity, spin and charge order, and non-Fermi liquid behaviour in novel d- and f-electron materials. 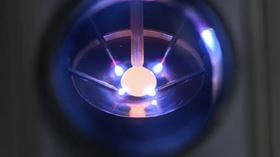 Our experimental investigation of correlated electron materials are enabled by approaches such as materials synthesis and single crystal growth, low temperature physics, and high-pressure physics. Our lab has facilities for materials synthesis and crystal growth, x-ray diffraction to characterize materials and orient single crystals, and apparatuses for performing various types of transport, thermal, and magnetic measurements, some of which can be done to low temperatures in the mK region, pressures into the megabar region, and magnetic fields up to 10 tesla. We collaborate with other groups to perform specialized measurements such as neutron scattering, photoemission, infrared spectroscopy, etc. Do you think that researchers should also be teachers? Absolutely. Teaching by researchers benefits both the researchers and the students they teach. The process of teaching helps researchers to organise their thoughts in a more logical way, develop a better understanding of the subject they are teaching, and become more effective communicators. This has a positive effect on the performance of research and the communication of research results at conferences and workshops. Teachers who are actively engaged in research on a subject they are teaching can also inspire students and serve as role models. This can also be a mechanism for recruiting research students. Being around bright and enthusiastic young students can be very uplifting. How do you measure your own progress as a group? This is difficult to quantify. We try to keep the various activities involved in the research moving along at a steady pace in the direction of our research objectives. One quantitative measure is the number of high quality publications in prestigious journals and invitations to give talks at conferences, universities, and research institutes. It is important to have a research agenda in which you and your postdocs and students are working towards well-defined objectives on interesting and challenging problems at the forefront of one’s research field. A central theme of our research involves closing the “feedback loop” between synthesis and measurement. So we have to both work independently and across teams. We have group meetings each week in which group members discuss their experimental results, relevant papers in the scientific literature, and concepts and ideas upon which the subject of their research projects are based. Of course, there are other important attributes for a successful researcher. It is important to have the tenacity to overcome obstacles in research and see difficult and challenging problems through to a successful conclusion. However, in pursuing your objectives, you sometimes discover a more interesting research avenue that takes you in a different direction. It is important to be flexible and open to these new opportunities, which can be more fruitful and rewarding than your original objective. 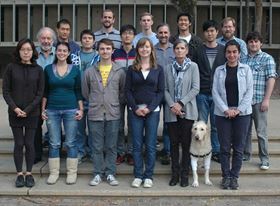 Professor Maple's group (Photo courtesy of UCSD). What does the future hold for your group? Another area of interest is matter under extreme conditions of low temperature, high pressure, and high magnetic field, and we’re investigating thermoelectric and magnetocaloric materials for energy applications. No dramatic changes of direction are planned, but we are always open to the possibility that a more fruitful avenue may appear in the course of our present research.